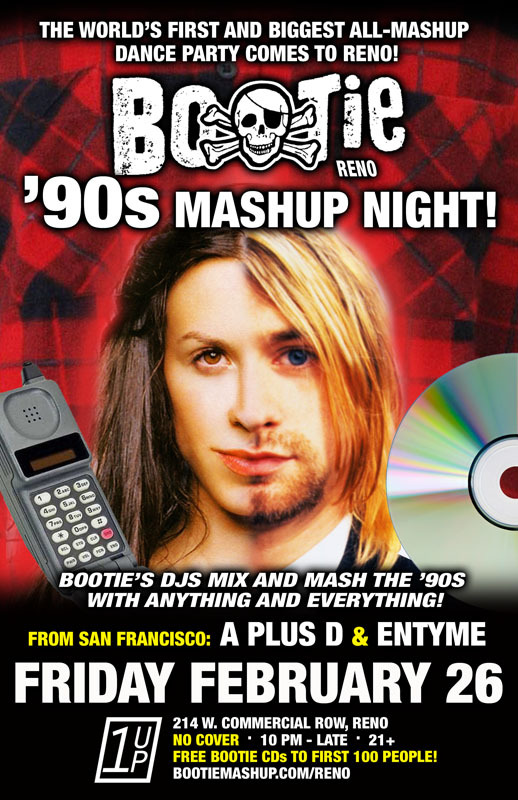 Bootie’s DJs mix and mash the ‘90s with anything and everything! When you think of the ’90s, you realize it was a decade that was musically mixed up. Nirvana or Prodigy? Snoop Dogg or Backstreet Boys? Spice Girls or Alanis Morrisette? Well, when Bootie throws a ’90s party, you pick ALL of them … mashed up, of course! Bring your acid-washed wonderfulness, flannel and ripped denim, board shorts, leotard and jeans combos, baggy jeans, and hip-huggers … the ’90s are back for one night! Resident DJs A Plus D and Entyme will be mixing and mashing all the ’90s genres with music from multiple decades, paying homage to the era while keeping the music fresh. Brought to Reno by Fresh Bakin’ and settling in at the 1Up, Bootie pulls out all the stops for a cover-free mashstravaganza, with no dress code, and the only requirement to get in is that you’re ready to have fun while hearing the best in mashups from around the globe. Get ready to hear diverse genres of music in all new ways. The Bootie crowd is like a mashup, everyone is welcome to come get crazy and have a good time.